Summer-Proof Your Hair from chlorine, salt and sun damage! 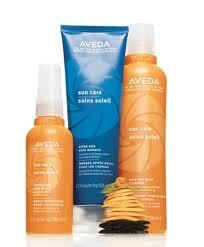 Aveda's Sun Care line offers three solutions to your summer hair problems. Cleanse: The Sun Care Hair and Body Cleanser removes chlorine and salt from your skin and hair. It is a color safe cleanser (wahoo!) that helps maintain moisture balance. Perfect for after those pool and beach visits! Restore: The After-Sun Hair Masque restores sun-exposed hair with plant oils. Protect: The Sun Care Protective Hair Veil provides you with 16-hour UV Defense. You put sunscreen on your skin, why not your hair too? This spray is also water proof - making it ideal for any summer outdoor activity!